This section discusses junction design from a cyclist’s perspective. It explains how cycling can be best accommodated in different circumstances, and how the proper design of a junction can greatly increase safety for cyclists. There are a number of features that will appear frequently in junction design. This section also looks at these to give an understanding of their purpose in a cycling environment. Junctions are critical components of cycling networks, and cycle-friendly junctions facilitate the safe and efficient passage of all modes of transport. 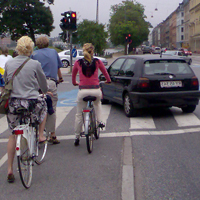 In urban areas, the majority of cycling accidents occur at or close to junctions. This is primarily due to the inherently complex nature of mixed mode movements at junctions. Better consideration and application of the Principles of Sustainable Safety should result in improved safety and efficiency at junctions. The section highlights the particular challenges that junctions present to cyclists, and identifies ways in which designers can cater for cyclists. Merging and splitting facilities that are located close to junctions increase the junction’s complexity. They can generate turbulence within the traffic system, and may increase the risk of accidents. While merges and splits are standard design on primary distributor networks, they should generally be avoided in urban areas intended for bicycles. Side swipe can occur with weaving vehicular traffic. Examples include left hand slip lanes, multi-lane one-way systems, merges and splitting, as well as dual entry and dual circulating roundabouts, and can also include poorly designed bus stops and loading facilities. At low speed, side swipe can result in oblique collisions, generally involving material damage only to the vehicles. 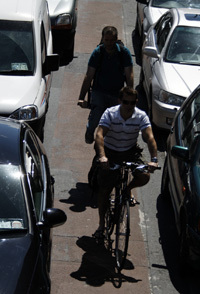 However, side swipe may be far more consequential if cyclists are involved in weaving traffic. Inherently, the appropriate or expected cycle position may not be clear to cyclists or to drivers, resulting in unpredictable, illegible and potentially hazardous situations. Eye contact between cyclists and drivers is essential for the safety of cyclists at junctions. Proper eye contact between cyclists and drivers allows them to communicate their intentions to each other. Junction layout that preclude or reduce the opportunities for proper eye contact should be avoided. The most common failure is at two-lane entry from side road or roundabouts where the desired line of sight is inevitably obstructed by the vehicle in the outer emerging lane. Equally, at oblique or Y-junctions, the oblique angle will make it very difficult for drivers to see the approaching cyclist. One of the biggest challenges facing road designers is ensuring the safety of road users at junctions. The section deals with the Principles of Sustainable Safety as they relate to junctions, and highlights the issues that must be considered in providing for cyclists. 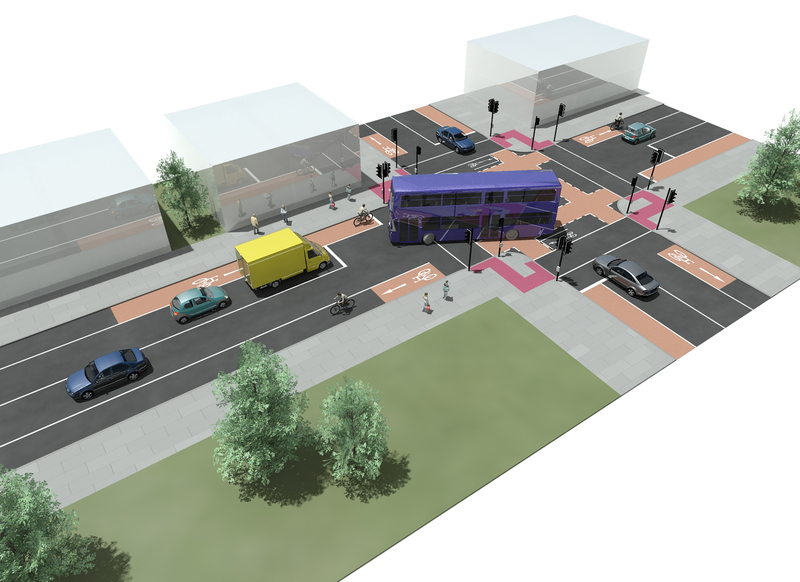 Properly designed junctions cater for all road user movements and are fit for purpose. Accidents will occur at junctions where normal movements are not catered for. At the design stage of junctions, each approach and exit must be assessed for each mode using the 6-way check. If particular movements cannot be incorporated, (e.g. a particular right hand turn, etc.) they should be specifically precluded and an alternative provided, but only as a last resort. Low traffic speeds through junctions will allow more time to react. Within urban areas, where pedestrian crossings are commonplace, traffic speeds should ideally be limited to 30km/h. At mixed mode junctions, including cyclists typically travelling between 15 and 20km/h, traffic speed should be no more than 40 to 50km/h. Narrow traffic lanes passively reduce traffic speed. Traffic lane widths in urban areas should not exceed the widths specified in the Traffic Management Guidelines, and this manual recommends that through traffic lane widths should not generally exceed 3.0m in any case. A legible junction is one where road users can understand the layout, and understand what is expected of them and other road users. In legible junctions, it is obvious where other road users should be positioned within the junction. Sharp or unexpected changes in direction or speed may be indications of poor junction legibility. If junctions are clearly defined and legible, potential conflicts will be obvious and predictable. It is important that designers incorporate junction controls (yield priority, signal control, gap acceptance etc) that are clear, universally understood and manageable by all road users. A forgiving environment is one where the outcome of any unforeseen circumstance or road user error is mitigated to the greatest extent. The focus on delivering forgiving environments must be on pedestrians, cyclists and other vulnerable road users who are most at risk of injury in the event of an accident. Reducing the amount of time (or crossing distance) that the vulnerable user is exposed to conflict. Ensuring that junction entrance and exit lanes are properly aligned. Removing guardrails and other entrapment risks, as recommended in the Traffic Management Guidelines, 2003. In order to provide cycle-friendly junctions, designers should fully understand the preferences, needs and expectations of cyclists. The physical nature of cycling is such that cyclists try to maintain their momentum wherever possible (to reduce physical effort). Where cyclists are travelling straight ahead, they expect to have main road priority. Frequently this priority is compromised by traffic turning left. In this manual, various approaches to managing the left turn conflict have been set out, with the intention of maintaining cycling momentum and priority wherever possible. One key advantage of cycling (over private cars) is the ability to continue past queuing traffic to the top of junctions. Failure to provide space to do so will render the junction cycling un-friendly, with cyclists prone to the same congestion as general traffic. Kerb side pedestrian guardrails and poles can catch the handlebars of bicycles. At junctions in particular, cyclists are likely to ‘wobble’ more due to stopping, slowing down and starting up. Consistent with previous advice in the Traffic Management Guidelines, guardrails are not recommended at junctions. Furthermore, the width of cycle lanes at junctions should be increased by 0.5m where possible. Bicycle trips are generally short (e.g. 6km/20 minutes or less). Any time spent waiting at junctions will represent a higher proportion of the overall trip time compared to that for vehicular traffic. This will act as a deterrent to cyclists. Such delay can occur where signalised junctions are set up to maximise vehicular capacity and minimise vehicular delay. Delay in poor weather is much less acceptable to cyclists than to drivers of vehicles. The importance of shorter signal cycle times cannot be emphasised enough in relation to cycling (and walking). As many cycling accidents occur at junctions, care must taken by designers to ensure they are safe for use by those normally capable of independent travel, e.g. those between 8 and 80 years of age. Cycling should be open to a broad range of people, including those who are more risk-averse, and those who like to travel in company. Designers should consider adopting the 8 to 80 approach detailed at http://www.8-80cities.org/. 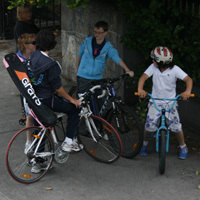 The Five Needs of the Cyclists are discussed in The Basics of this manual. At junctions, there are particular specific needs under the five different headings. Junctions are potentially the most dangerous parts of the cycling journey. 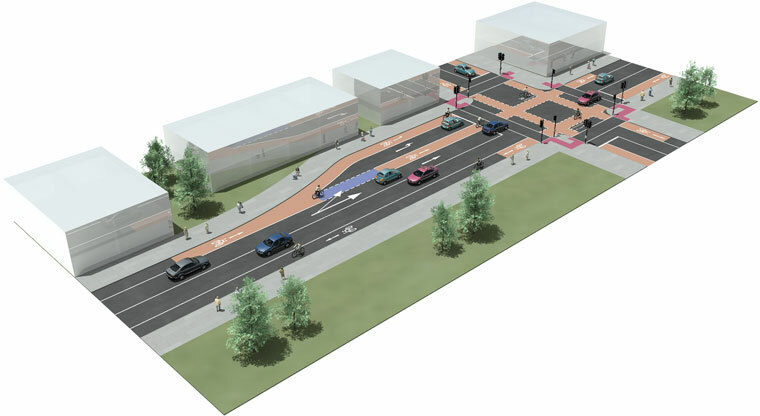 By applying the Principles of Sustainable Safety to their design and management, junctions can be made safer and the potential for collisions will be reduced. It is important that junctions have good surfaces so that cyclist can look ahead and around to observe traffic instead of having to look down to avoid potholes etc. Quality of Service should also be continuous. Cycle facilities should continue through junctions and be clearly evident to all road users. Cycle signage should be clear and logical at the approaches and exits from junctions. Direct, obvious and short connections through junctions are essential so as not to cause any delay. In the past, solutions that required cyclists to deviate from the main route sometimes involved tight radius bends, multiple ramps, mixing with pedestrians and negotiating between pedestrian guardrails. Such facilities are often a waste of resource, as cyclists frequently take the more direct route and mix with traffic. Cyclists always appreciate adequate stacking space at junctions as it allows them to wait comfortably without losing balance. Stop times for cyclists should be minimised so as to reduce exposure to inclement weather. Cyclists who are familiar with particular junctions will also appreciate good sightlines on the approach to traffic signals. This allows them to gauge their speed to arrive at a green signal and minimise any loss of momentum. Traditional urban junctions, designed primarily for vehicular movements, may have tended to subordinate the role of cycling and walking. Indeed, the practice of traffic signal staging has developed on the basis of dealing with vehicular traffic volumes first, and attending to pedestrian crossing movements at the end of the process. A new approach to junction layout and signal staging is required, to reflect the changing priorities in traffic policy. To achieve high Quality of Service for cyclists, junctions should be able to cater for the projected cycling volumes and all bicycle turning movements, as well as minimise cyclists’ delay as much as possible. 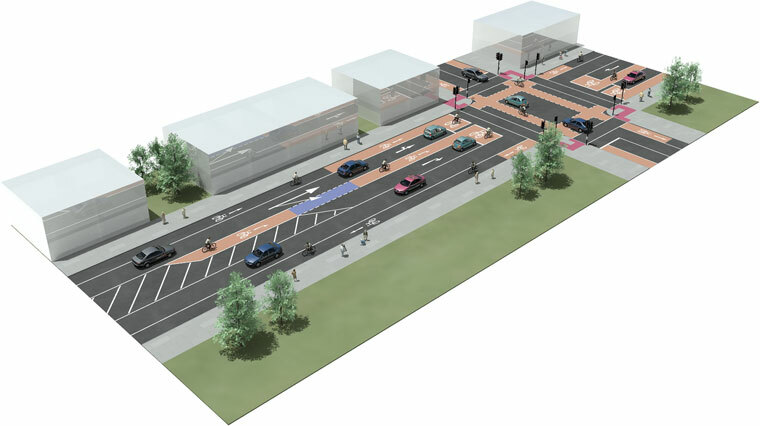 Cycle route design is likely to require a fundamental re-appraisal of existing junctions. It is likely that vehicular volumes, particularly in urban areas, will have to be reduced in order to cater more appropriately for cyclists and pedestrians. The Traffic Management Guidelines, DTO 2003, Section 8.3 are of particular interest in this respect. 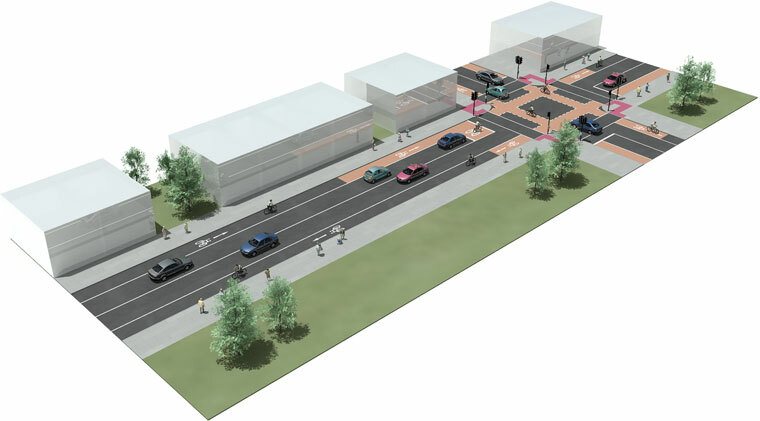 The needs of cyclists and pedestrians should be considered as a fundamental part of the design process rather that as n afterthought once vehicular traffic has been catered for. At congested locations extra capacity should not be provided to the detriment of road safety or facilities for vulnerable road users. ASLs are used at signalised junctions to facilitate stacking of higher volumes of straight ahead cycle movements, and also to accommodate right-turning cycle movements. They permit cyclists to stop and wait in a forward position, ahead of stopped vehicular traffic. ASLs allow cyclists to commence the straight ahead or right turning movement before the other traffic. 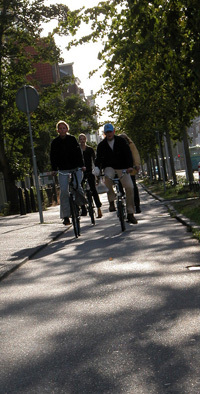 Their prominent location and coloured surface increases driver awareness of the presence of cyclists. They should be 4-5 metres in length to allow enough space for cyclists to manoeuvre into the correct position. They should have a coloured surface for legibility. ASLs have a stacking purpose when traffic at a junction is stationary. If ASLs are intended to assist right-hand turning cyclists, they should only be deployed at junctions where it is safe for cyclists to weave to the right through traffic. In heavier or faster traffic, use the Box Turn (Left-To-Go-Right) solution instead of ASLs. ASLs must always be “fed” by a cycle lane to ensure that cyclists can pass stationary traffic and get to them. 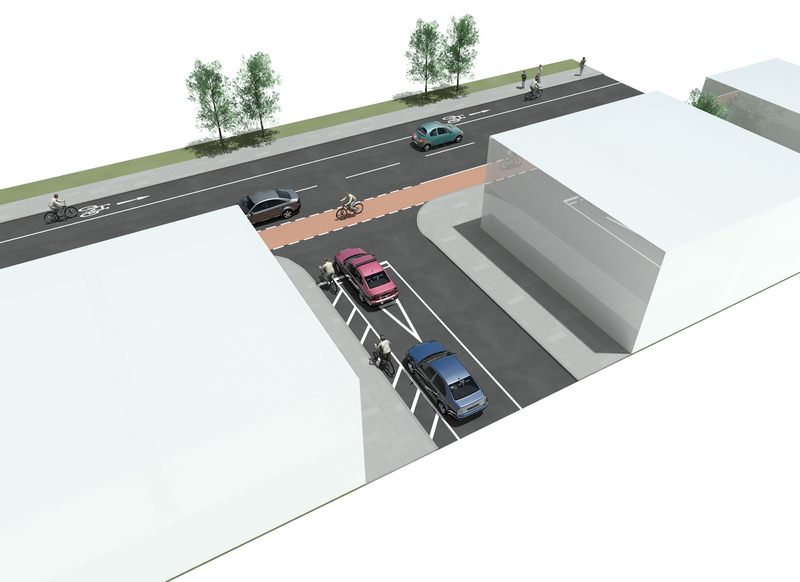 If no feeder cycle lane can be provided, do not introduce an ASL on its own, as this will only frustrate cyclists and encourage them to mount the footpath etc. to access the ASL. Each traffic lane should have its own ASL as in many instances, traffic lane movements are separately signalised. 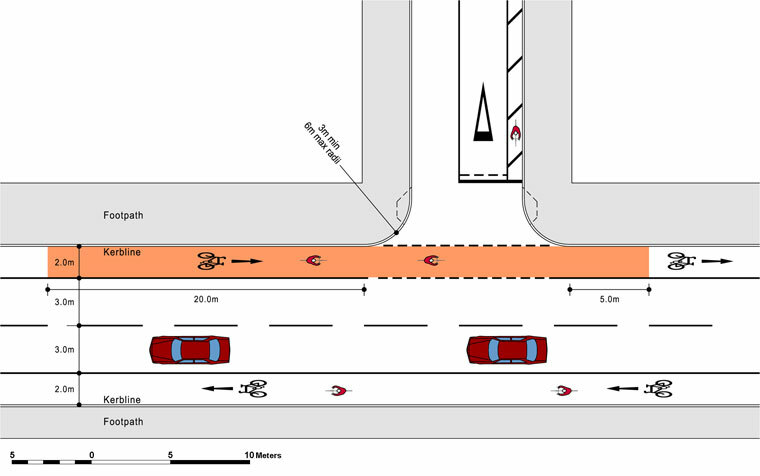 In cases where two traffic lanes have separate cycle lanes, it may be appropriate to provide an ASL at the head of each lane. In the second example below, the kerbside lane provides for straight ahead movements, and the outer lane caters for right turning cyclists. Note that the ASLs are not joined together. ASLs must never face opposing traffic, unless they are separately signalised – this is because cyclists are inconspicuous and vulnerable when opposing tight turning traffic turn at the same time. A better solution is the Box Turn (Left-To-Go-Right). Never provide an ASL on a traffic lane with significant HGVs, as truck driver may not be able to see the bicycle in front of the cab. In such cases, consider Set Back Stop Lines, signalised cycle tracks and box turns. At tight junctions, larger vehicles may need to track well into the junction to turn left, and a set back vehicular stop line may be necessary. Where there are HGVs, cycle track should be segregated up to the stop line, and separately signalised. See 4.5.5 Left Turning Large Vehicles: Functionality below. Weaving is a mechanism by which cyclists wishing to turn right will move across traffic while approaching a junction so as to get into the correct road position or lane. In mixed traffic, cyclists should be in a central position within the traffic lane already, and a simple hand signal coupled with a gap in the oncoming traffic will facilitate the right turn. Where cycle lanes are provided, the cyclist must signal with one hand, look over the shoulder for gaps in the traffic, move to the centre of the general traffic lane or to the dedicated cycle lane, wait for a gap in the oncoming traffic and complete the turn. Weaving involves a combination of actions which can all affect balance. Good quality road surfaces are essential to allow cyclists to focus their attention on other road users. Lighting is important for cyclists to give them greater confidence that they themselves are visible. Predictable traffic behaviour will greatly assist cyclists preparing to weave. Motorists are familiar with weaving at on and off ramps and on dual carriageways, and are keenly aware of the importance merging at a similar speed to the main traffic flow in order to merge smoothly and avoid collision. For the same reason, cyclists should weave only in a low vehicular speed environment. As cyclists generally travel at around 20km/h, the actual speed of traffic should not exceed 35km/h. Multi lane roads are higher speed environments by their nature and cyclist weaving is not appropriate. In multi lane roads, there is a risk of side swipe (see earlier). The higher speed differential and added complexity of looking for two or more simultaneous gaps presents too high a risk for cyclists. For this reason, cyclists wishing to turn right should be accommodated using Box Turns (Left-To-Go-Right) solutions or Crossings. A well designed approach will ensure that the junction is legible and predictable for all road users. 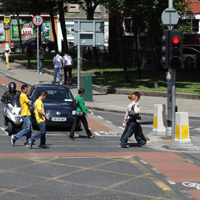 Cyclists must be considered at the outset of the design process and fully integrated within the overall junction solution. This section discusses some of the key design issues that should be considered at junction approaches. The introduction of flares and merging either side of a junction generally represents an attempt to increase vehicular capacity. However this may impair legibility and the provision for cyclists. It is frequently impossible to properly align entry and exit lanes, particularly where two entry lanes become a single lane on the far side of the junction. Flares tend to result in faster, less predictable and less legible junctions, with sub-standard provision for cyclists and pedestrians. The second lane or flare introduces vehicular weaving and may increase vehicular speed. For the above reasons, flares are not recommended for cycling environments. If junctions need to accommodate occasional larger vehicles, consider using roll-over areas instead of widening the entire junction. The standard minimum width for a cycle lane is 1.75m in any case. This manual recommends that cycle lanes should widen by up to 0.5m for the last 20-30m approaching junctions when appropriate. 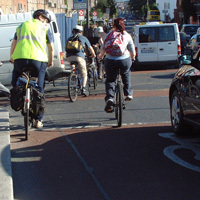 Streaming lanes are cycle lanes located between a through traffic lane and a turning pocket (e.g. a cycle lane located between a left turn pocket and a straight ahead / right turn traffic lane). 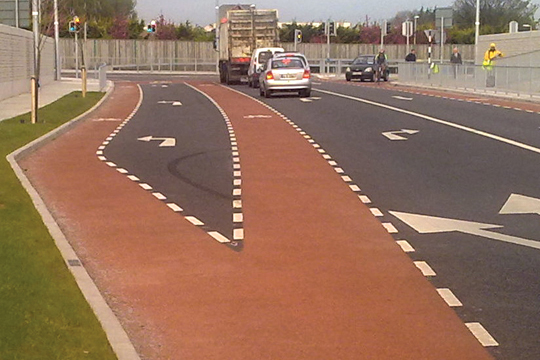 The streaming cycle lane should be 2.0m wide to take account of moving traffic on both sides of the cyclist. 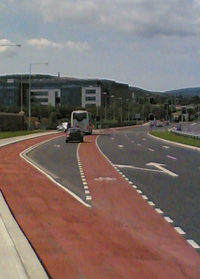 In such arrangements, the straight ahead cycle movement takes priority, and the left turning vehicular traffic must be required to cross left over the cycle lane. 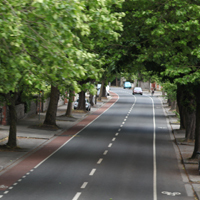 Streaming cycle lanes can only be used in low traffic speed environments where there is minimal speed differential between cyclists and adjacent traffic. Streaming is not suitable along HGV routes. The permitted weaving area for traffic to cross the cycle lane must be clearly indicated and limited to no more than 10.0m long so as to reduce vehicular speed, and profiled line markings should be considered for the solid white line beyond the weaving area. 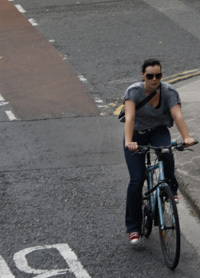 Streaming cycle lanes should only be used beside right or left hand pockets (i.e. distinct lanes dedicated to turning movements) and should not exceed 30.0m in length. Cycle lanes should be clearly visible in all conditions, including night time and poor weather. Where there is insufficient room for a cycle lane, kerb-side hatching can be used in low speed and low volume mixed street environments. The purpose of the hatching is to keep traffic away from the kerb and provide cyclists with some limited passage to a junction when traffic is stationary. Cycle logos in the traffic lane should always accompany kerbside hatching. As kerb-side hatching is narrower than cycle lanes, cyclists should “take the traffic lane” once traffic starts moving, as the clearance between the traffic and the kerb is not sufficient. Kerb-side hatching should never be longer than 30.0m so that cyclists can travel the full length during the red signal phase.